Size: approx. 15-20 mm. Photo: 10/11/11, 10 pm. 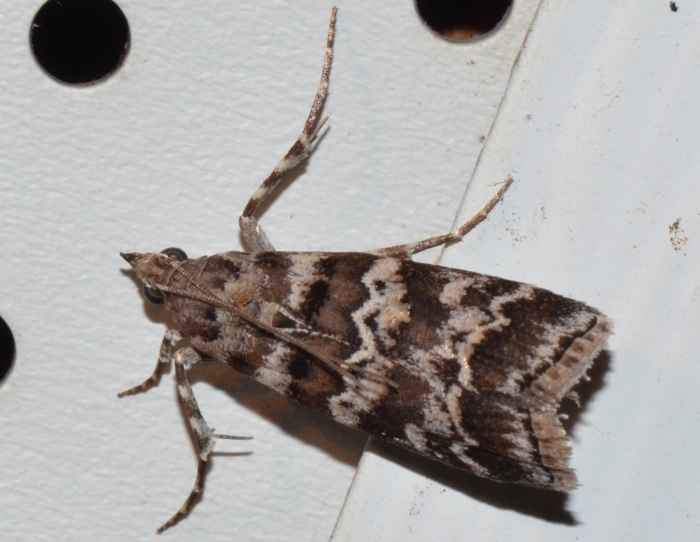 This moth is probably a Southern Pine Coneworm Moth (Dioryctria amatella), also commonly known as a pitch moth. It is one of the most damaging pests of pine seed orchard crops but also attacks other parts of pine trees. A symptom of infestations is large external masses of pitch exuding from the feeding sites of caterpillars. D. amatella is one of six species of pine coneworrns in Florida.